The Family System Test (FAST), developed by Thomas M. Gehring, is an important new tool for investigating family relations. Based on the structural-systemic theory of families, it is a figural technique for representing emotional bonds (cohesion) and hierarchical structures in the family or similar social systems. In this unique volume, the editors draw on current theory and research in family or similar social systems together with a variety of empirical studies that have used the FAST, to provide a comprehensive overview and assessment of the test and its use in various clinical research contexts. The book is divided into four sections, each focusing on a different aspect of the FAST. Part 1 describes the concepts and psychometric properties of the FAST within the context of theoretically and empirically relevant aspects of the field of family psychology as a whole. Special emphasis is given to systematic-structural approaches to assessing individual and family functioning. Part II focuses on the use of the FAST in developmental research. For example, the the FAST has been used to show how family constructs are influenced by age, type of family and situation. Part III deals with cross-cultural issues and compares the interpersonal constructs of Japanese and Chinese families to Western families. Finally, Part IV addresses the applications of the FAST in clinical setting - in diagnosis of biopsychosocial problems and planning and evaluation of clinical interventions. The result is a book that helps to bridge the gap between theory, practice and research. It will be essential reading for users of the FAST and all clinicians and researchers who work in family relations and development. Notes on Contributors. Bagarozzi, Foreward. Gehring, Debry, Smith, Preface. Part 1: Understanding Family Structures: Theory, Assessment and Methodology. 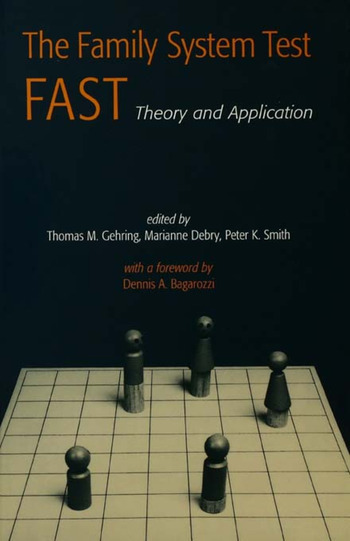 Gehring, Marti, Concepts and Psychometric Properties of the FAST. Debry, The FAST at the Crossroads of Systemic Theories. L'Abate, Snyder, Comprehensive Family Evaluation. Lebow, Relational Diagnosis: An Overview of Methods. Part II: Interpersonal Patterns in Nonclinical Family Systems. Morley-Williams, Cowie, Investigation of Family Schemata of Pre-school Children: Methodological and Conceptual Considerations. Meyer, Family Constructs of First Graders: Different Measurement Approaches Yield Distinct Outcomes. Berdondini, Genta, Perception of Internal and External Family Boundaries by Well-adjusted Children, Bullies and Victims. Smith, Myron-Wilson, Sutton, Comparing Parents' and Children's Perceptions of the Family: Can the FAST be used as a Measure of Social Cognition and Theory of Mind Ability? Hunter, von Ballmoos, Single-parent Families: How Does the Loss of the the Father Influence the Father Image of Mothers and Daughters? Part II: The Fast in Asian Cultures. Ikeda, Hatta, Perceptions of Family Structure. Shu, Smith, Characteristics of Three-generation Chinese Families. Part IV: Clinical Issue: Diagnosis, Interventions and Evaluation. Rigazio-DiGilio, The FAST: A Therapeutic Tool for Interactive Assessment and Treatment in Family Psychotherapy. Gehring, Page, Marti, Conceptualization of Parental Interventions in Child Psychiatry. Steinebach, Supervision: Reflecting Clinical Practice and Team Development. Debry, Gehring, Conclusions and Recommendations. Index(Name and Subject). Thomas M. Gehring is Senior Lecturer for Clinical Psychology at the University of Basle and Health of the Section of Methodology and Evaluation at the Department of Social and Preventative Medicine, University of Zurich. He is the author of the Family System Test (FAST). Marianne Debry is a Professor at the University of Liege and Head of the Department of Child and Adolescent Psychology. She has translated the FAST manual into French. Peter K. Smith is Professor of Psychology at Goldsmiths College, University of London and Head of the Unit for School and Family Studies. `This is a unique book ... It offers all those who make use of family systems theory in therapy an opportunity to explore the benefits of objectivity without compromising their therapeutic integrity' - Peter Randall, University of Hull.